The saddest thing is we have had a draft environmental statement consultation and events, a main environmental statement consultation, community forums and a range of other events including the recent petitioning stage at the select committee all with the community replying and engaging in relation to a tunnel at a completely different depth. Since 2012 residents have been told and believed the HS2 tunnel in Ruislip (known as the Northolt tunnel) would be 30m deep. 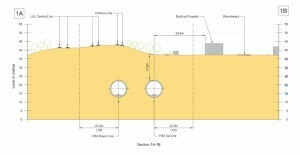 2.2.7 The Proposed Scheme will cross the western boundary of CFA5 in twin-bore tunnels. In maps given to some individual petitioners before their select committe appearances in June 2015 the depth of the tunnel was stated as 29.5m. For others just a road further along it was much shallower. “Further to our email exchange earlier today, I am sorry to have to say that the additional checks we said we would carry out have uncovered an error in the depth measurement presented in your exhibit (P6897). As you may know, during the hearings today, the Chairman of the Select Committee raised with leading counsel for the Promoter, the question of whether the cross-sections which have been shown to the Committee in relation to petitioners, including yourself, who have raised settlement issues, are accurate. I understand that the Chairman raised this issue in the light of Luke Shirley’s evidence. The Promoter is therefore looking again at all of the cross-sections which we produced and presented to the Committee. We have found that on your cross-section (P6897), we have erroneously shown the ground level as being above 50m AOD (Above Ordnance Datum) in this location. The correct ground level is in fact around 15m lower. Accordingly, the distance between the top of the tunnel and the ground level, shown on the cross-section as 29.2m, was incorrect. The correct distance is in fact 14.9m. In light of this error, we are carefully checking the other information shown on the cross-section and we expect to complete this during the course of tomorrow. We will send you a corrected copy of the cross-section as soon as those checks are completed. I should make clear that this error is confined to the drawing which was produced for the purposes of the hearing of your petition. It does not affect the assessments of ground borne noise/vibration in the Environmental Statement, or the assessment of tunnelling induced settlement as shown on the settlement contour diagram (P6896). These assessments were carried out prior to, and independently of, the creation of the cross-section referred to above. I apologise that we were not able to respond by 5pm as you requested. As I am sure you will appreciate, we wanted to be absolutely certain that we were now providing you with the correct information. I am copying this email directly to Nick Hurd MP and will try to speak to him ahead of tomorrow’s hearing to ensure he is aware of the situation. We will also explain the position to the Committee. They made this statement to the select committee on the morning of the 1st of July, view here from minute 9.31.21 onwards. It was officially an apology but only really for one map/document not all the other years of confusion and numerous other documents that led us to believe the tunnel was deeper than it was and therefore that our homes were safer than they are. We have requested a full list of all the mistakes made and a full apology to us and to the committee. We have also asked that they inform all other affected residents whether they petitioned or not. We await the promised meetings and information. Greece is finding when others own your debt and you cannot print your own notes Society Collapses. Lord Gus O’Donnel mentioned the nudge politics which translates into Sentimental Politics the theme of this and the last Government the situation is catastrophic. Spoilt child MPs who have and who take what you have. The UK had a possible felexibilty from not joining the Euro but it is a junky trap. Cameron and Osborne led sentimental approach has provided this poor scope and plan of HS2 and of HS3 as both arer far from best value for money or realistic national highest need requirements. Tunneling example is about the lack of frankness and the legally supported sentimental situation. The UK politicians need to face facts not propose to excite sentiment. Cameron is being seen as that spoilt person lead by populist and party not nation paramount needs. Wake up Britain and the UK before it is learnt the UK with regional devolution becomes the same as EU with Greece: Dysfunctional societies trapped into being ousted from the share by sentimental mismangement please.